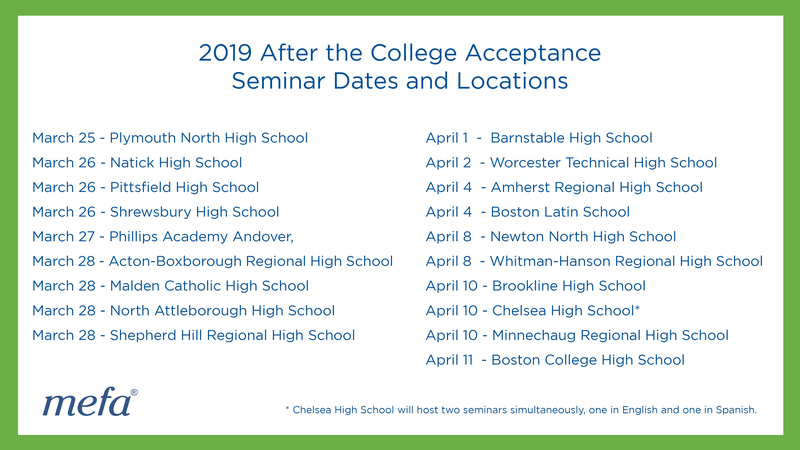 Boston – National College Decision Day is May 1st, which means that high school seniors have just under 50 days to decide where they will spend the next few years pursuing their post-secondary education. As students begin to receive their college acceptance letters, many families are left grappling with how to understand and compare financial aid award letters and make the best decision for their family. “We know that families have a lot to consider as they make the college decision and determine a plan to pay for higher education costs. Our mission is centered on guiding families through the college planning process to help them understand their financial aid awards and plan their next financial steps,” said Thomas Graf, Executive Director of MEFA. MEFA’s seminar schedule is available online at mefa.org/events/after-the-college-acceptance/. To learn more and find all the resources provided in this program, families can visit mefa.org/collegbound2019. Additionally, families should consider signing up on mefa.org to receive MEFA’s email curriculum. For those that have questions or want to talk further about planning for college, MEFA’s College Planning Experts can be reached by email at collegeplanning@mefa.org or by phone at (800) 449-MEFA (6332). MEFA is also on Facebook, Twitter, and LinkedIn. MEFA is a not-for-profit state authority, not reliant on state or federal appropriations, established under Massachusetts General Laws, Chapter 15C. MEFA’s mission, since its founding in 1982, has been to help Massachusetts students and families access and afford higher education and reach financial goals through education programs, tax-advantaged savings plans, low-cost loans, and expert guidance. All of MEFA’s work aligns with the ever-present goal to support the independence, growth, and success of Massachusetts students and families. Visit mefa.org to learn more or follow MEFA on Twitter @mefatweets and on Facebook at mefaMA.